People often ask me what is the first .22 rifle they should by and the answer from me and most likely everyone else will be the venerable Ruger 10/22. Mainly because of it's versatility and ability to morph into something completely personal to each owner. 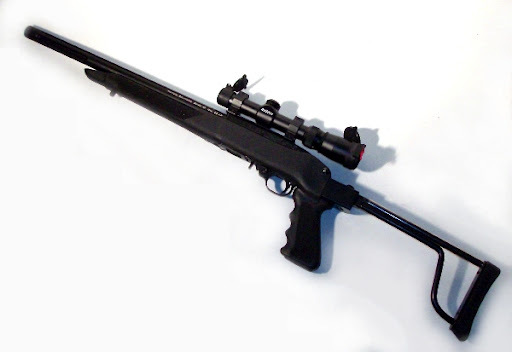 Few would argue that the Ruger 10/22 is the most fun hunting and plinking .22 rifle made. It's pretty accurate in stock form, quite reliable, and the best part is that it consumes cheap little 22LR rounds which we all know it a hoot to shoot. The history of my Ruger 10/22 Sporter is an interesting one. One of my friends gave me a "expensive antique blackpowder shotgun" as payment for some consulting work. "Expensive" is a relative term and my buddy had some seriously misguided beliefs in firearm value. Disappointed and ticked off at my friend as I was years later after a $150 appraisal of the "antique", another employee at the shop was nuts over it and handed me a little over $200 in cash... which of course was just enough to walk out with a Ruger 10/22Sporter back then. At that time, my father had more of a need for a good 22LR on his acreage so I provided him with the 10/22 on long-term loan. Over time, dad complained a bit about his eye sight and I mounted a 1.5x-5x variable power Simmons Prohunter scope with A-Square rings, this combo tightened groups considerably to around 1" at 30 yards in both dad's and my hands. 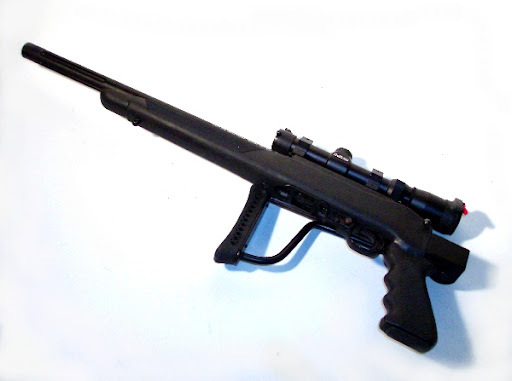 The Ruger10/22 Sporter had decent accuracy and despite only being cleaned about a dozen times in it's 18+ year life, sometimes with just a spray of WD-40, it was extremely reliable. There is always room for improvement and I picked up some extras for the Ruger 10/22 along the way. A Butler Creek Folding Stock and 25 round banana magazines purchased previous to the idiotic temporary ban of the 90s. These two accessories provided plenty of AR style plinking fun. After the rifle returned to my stable when my dad no longer has use for the gun, the 10/22 seemed to permanently wear the Folding Butler Creek stock. I loved the American Walnut stock, but the Butler Creek stock was quite a bit more comfortable to shoot and I didn't feel bad when the rifle was knocked around. Since my particular 10/22 never saw the inside of a gun case and my old bikini covers were showing thier age, I thought some Butler Creek pop open scope covers would be good insurance for the scope after my last cleaning... and they were worth every penny. Reliability of the extractor was starting to fad after 18+ years and a jillion 22 rounds. I pulled the extractor and re-sharpened it to a razor point, eventually a Volquartsen Edge extractor would be in order. What did start to bug me was the lack of pinpoint accuracy when bench shooting at the range. On one particular outing, the gun was being out shot by my own 4" barreled 22 pistol which I thought was just ridiculous. Some digging and I decided to add a Tactical Solutions 16.25" Threaded Barrel to up accuracy. The TacSol 10/22 Barrel features a chamber something in between Match and standard, the idea is high accuracy without a picky feeing rifle. A guy I know has some $400 match barrel and can only shoot match grade ammo... very little fun in that. I previously owned a now discontinued Desert Eagle 22LR pistol that had a barrel with a barrel liner and it worked wonderfully. 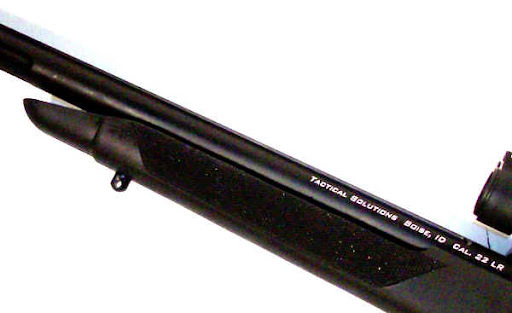 Tac-Sol has the same setup on its barrels with a stainless barrel liner surrounded by a heat dissipating billet aluminum shroud. The end result is lightweight super cool operating barrel with match grade accuracy. My old stock barrel was just over 28 ounces and the new Tac-Sol 10/22 barrel is half the weight at 14 ounces. Quite a nice gift in the process of adding a shorter match grade barrel. An extra bonus is that the barrel's end is threaded with 1/2"-28 threads. My hope is to eventually pick up a suppressor and compensator for to the rifle, but in the interim the included thread protector lines up so nicely, you would never know the threads were there. Mounting the barrel was pretty simple. Un-mount the old stock 10/22 barrel which is as simpleas removing the stock and removing the two wedge mount machine screws. My old barrel slid right out. As advertised, the Tac-Solutions barrel required some fitting via a couple spins on a some 2000 grit sandpaper. In my case I used the sandpaper just enough to take off most of the anodizing to facilitate a tight twisted in hand fit. With a fatter bull barrel, you do need a stock to accommodate the extra girth but I wasn't about to let my old Butler Creek Folding stock go. The solution was to trim the stock down via my router table and a nose clip of the stock on the band saw. The result was something like Blackhawk's Axiom stock that free-floats the barrel and coincidentally provides enough clearance for the fat Tac-Sol barrel. Many have touted the quality of Tactical Solutions barrels and I would like to echo thatsentiment. The machining and anodizing is flawless. 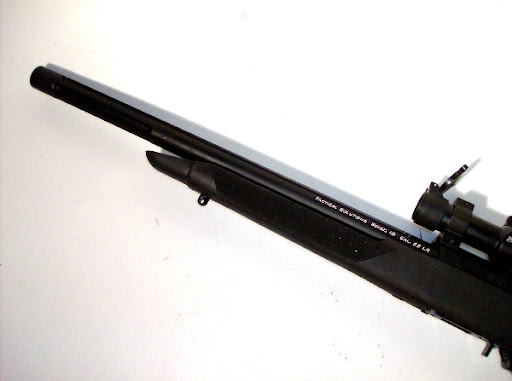 Fitting the barrel was as easy as any other and the aluminum heat dissipating shroud, greatly reduced weight, shorter length, andthreaded versatility all add up to a much lighter and handierrifle. Retaining the Butler Creek folding stock makes for a very short and stowable camp and truck rifle that is about 26" long when folded. This little rifle can easily stow away in a short tacticle case and will easily ride is the tightest trunks. How's it shoot? 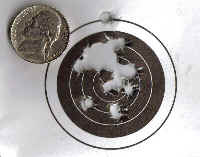 Internet research notes many are getting 1/2" 10-shot groups at 50 yards which I would be delighted with, so I am very hopeful. I am in the midst of a move and still looking for a decent range, so I have only worked the barrel at the indoor 25 yeard range. I had a chance to do a little indoor shooting on a 25yd range and though not ideal sitting on a chair balancing a rifle on a bouncy plastic range rail I managed the above groups. 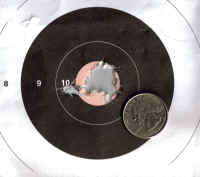 The "Dime" sized 10-shot group was with Eley Ltd Remington Target Rifle ammo. 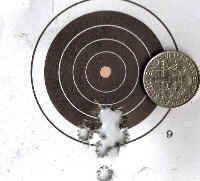 The group with a "Nickel" to the right is a 20-shot with cheap Remington hollow point carton-o-bullets. Given the shaky rest (note fliers in either group) these groups are about 1/3 the size of my historic best from my stock barrel. I think 1/2" groups off a solid rest is definitely doable. The weak link on the setup now is my aged but still functional Simmon ProHunter. At some point I will tack on a much higher power and better quality scope with parrellex adjustment and groups would decrease as well. I am happy with how handy and light my little buddy has become and definitely impressed with my Tac-Solutions Barrel.. Right around an inch at 50 yards with cheap SuperX Ammo. I am happy with that with only a 5X scope.